We look forward to bringing people an amazing cup. It is our mission to provide our partners with a quality experience each time we work together. We’re proud to source high-quality coffee from across the world. Slate Coffee Roasters is a family-owned specialty coffee roasting and retail company founded in 2011, and located in Seattle, Washington. For us, quality is always the result of collaboration. To that end, we pursue relationships with everyone from the producers of our coffee, to our wholesale partners, suppliers, community, and guests. We seek coffees that have a uniqueness or a special characteristic about them, and we try to be as transparent as possible. By providing you information on the region, district, elevation, processing, etc. ; we hope to give you a glimpse into the story of your coffee, and the long journey it has made. We roast with a philosophy we call exposure roasting. 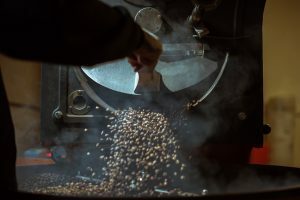 The idea is to roast the coffee seeds just long enough to highlight the inherently unique characteristics without roasting over these characteristics. We believe that this lighter roast allows for a better ability to distinguish — via taste — the nuances that various processing, varieties, and regions have on coffee. Exposure roasting aims to honor and highlight all the hard work the producers put into making their coffee delicious. At our coffee bars we brew our coffee honestly, that means with intention and innovation, viewing coffee as both an art and a science. We use a modern menu and beautiful glassware that highlight the coffees and beverages that we serve. Whether you are looking to spend some time in our intimate cafes, or taking a cup to go, we promise unparalleled hospitality and a delicious beverage. Slate is a family business and coffee is our opportunity to invite you into our home.